Artificial Sweeteners: Lower Calories, But Good For You? Look at the label of just about any soft drink that has the word "diet" or "light" on it and you're likely to find an artificial sweetener in the list of ingredients. "Sugar-free" is another tip-off that artificial sweeteners are being used. And that is precisely the point of artificial sweeteners - they replace the high-calorie sugars used in other soft drinks with a substance that has a very low-calories count, if not zero. While this may seem like a good thing - lower calories and less sugar, in theory, means a slimmer waistline and lower risk factors for diabetes - however many people have questioned the safety of artificial sweeteners. What are some common artificial sweeteners? You'll find artificial sweeteners already pre-mixed in soft drinks and other beverages, but you often see them on restaurant tables as well, in little pink, blue or yellow packets next to the sugar. some of the more common ones are aspartame, (Equal, NutraSweet), acesulfame K (Sunnette, Sweet One), saccharin, sucralose (Splenda), xylitol, and maltilol. Where are artificial sweeteners used? Besides soft drinks, artificial sweeteners are found in many products, such as chewable vitamins, toothpaste, mouthwash, cereals, sugar-free candy, and many other foods. Sugar free chewing gum can contain as many as four different kinds of artificial sweeteners. Should I Avoid artificial Sweeteners? Not all artificial sweeteners are created equal. Each carries its own risks. 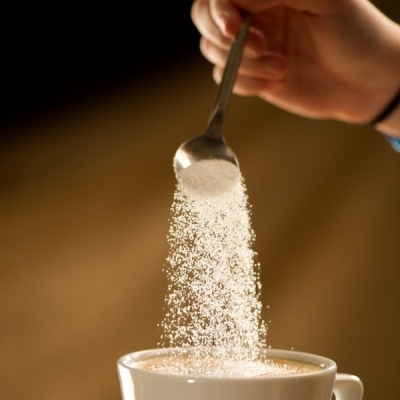 Saccharin, in particular, has long been believed by some to cause cancer. the FDA actually tried to ban saccharin in 1977 because tests on laboratory animals showed that it caused bladder cancer though it was linked to uterine, skin, ovarian, and other types of cancers as well. But because of pressure from the diet food industry (and loyal consumers) saccharin stayed on the shelves. Until the late 1990s, foods containing saccharin carried a warning label that stated it caused bladder cancer in laboratory animals. In 2000, the National Cancer Institute said that people who consume six or more servings of saccharin which is equal to two or more 8 ounce servings of diet drinks containing saccharin daily were shown to have "some evidence of an increased risk of bladder cancer, particularly or those who heavily ingested the sweetener as a tabletop sweetener or through diet sodas." But by some leap of logic, the powers that be decide that saccharin wasn't an important risk factor for cancer in humans because it just caused cancer in lab animals. Sucralose commonly known as Splenda, has also been shown to cause problems in laboratory animals. research has shown that sucralose can lead to decreased red blood cell count, hyperplasia of the pelvis, shrunken thymus glands, enlarged liver and kidneys, atrophy of lymph follicles in the spleen and thymus, reduced growth rate, extension of he pregnancy period, aborted pregnancy, decreased fetal body weight and placental weight loss, and diarrhea. Yet another common artificial sweetener is aspartame, which is sold under the brands Equal and NutraSweet. Aspartame is also used in many diet soft drinks. Aspartame is made up of three components: aspartic acid, methanol, and phenylalanine. These three principal components break down into substances that have been shown to be toxic to humans: formaldehyde, formic acid, and diketopiperazine, a chemical which can cause brain tumors. During a seven year study, rate were given the equivalent of four to five bottles of aspartame sweetened beverages for a human. The study found that aspartame consumption correlates with high rates of leukemia, lymphoma, and other cancers in rats. The carcinogenic effect of aspartame was found to be as low as 20mg per day. As far as the safety of aspartame goes, much of the research itself was called into question by Ralph G. Walton, MD, Chairman of The Center for Behavioral Medicine and Professor of Clinical Psychiatry at Northeastern Ohio Universities College of Medicine. Dr. Walton looked at the peer-reviewed literature on 164 studies on the safety of aspartame for humans. There were 90 non-industry-sponsored studies, of which, 83 or 92% of those identified at least one problem with aspartame. 74 studies were aspartame industry-sponsored, all 74 of these studies or 100% claimed that they found no problems with aspartame. These numbers certainly suggest that many industry-sponsored studies are at the very least influenced by those who benefit from aspartame being declared safe. Are there any artificial sweeteners that are safe? Why choose an artificial sweetener when you can find a natural sugar substitute that has all of the same benefits with none of the risks? Stevia is an herbal plant whose leaves are 10 to 15 times sweeter than sugar. The refined extracts of stevia are called steviosides and can be 200 to 300 times as sweet as sugar. Stevia is safe for diabetics because it won’t affect glucose levels and it doesn’t have any of the side effects that come with artificial sweeteners. (Diabetics should always check their glucose levels when introducing new foods just to be safe.) Stevia is also virtually calorie-free. Now that it’s becoming increasingly popular, you can find the concentrated powder form of stevia in just about any supermarket. You can even grow it at home. Talk to your local gardener—chances are they carry stevia plants along with other common herbs. Professionals in the natural healthcare will tell you that artificial sweeteners aren’t safe while the FDA will say that they are safe to consume. Who is a person to believe? Early detection isn’t quite the same thing as prevention, nor does it correlate with a decrease in mortality. While cancer diagnoses are increasing, the NIH and NCI will state that cancer deaths are declining. However, the Journal of American Medical Association [Vol. 283 No. 22, June 14, 2000] reported that “Although 5-year survival is a valid measure for comparing cancer therapies in a randomized trial, our analysis shows that changes in 5-year survival over time bear little relationship to changes in cancer mortality. Instead, they appear primarily related to changing patterns of diagnosis.” They may be detecting it earlier with their “testing” but overall outcome—death—is virtually unchanged. We have increased consumption of artificial sweeteners over the last 70 years, significantly increased funding for cancer research, all while cancer diagnoses continue to rise along with mortality rates. Please don’t misunderstand our point: artificial sweeteners aren't the only thing out there to blame for cancer. However, they do put a large “chink” in your armor. How much abuse can your body take before it gives into disease? But are you losing weight? If artificial sweeteners did what they are supposed to do and help us lose weight, perhaps the links to cancer could be overlooked by some. But according to Consumers' Research Magazine "There is no clear-cut evidence that sugar substitutes are useful in weight reduction. On the contrary, there is some evidence that these substances may stimulate appetite." Professors in the Department of Psychological Sciences at Purdue School of Liberal Arts found that these artificial sweeteners are interfering with our body's natural ability to "count" calories. When we eat, our body counts calories by determining how sweet and dense it is and uses this data to tell us when we are full. When we start artificially sweetening our food, this confuses our bodies inherent abilities to count calories. The bottom line is that our consumption of artificial sweeteners has gone up in correlation with cancer and obesity rates. In our opinion, Artificial Sweeteners just aren’t worth the risk so we won't recommend them. Don’t guess about your health… schedule a nutritional consultation today! Request an appointment for a nutritional consultation on line or call us at 773.878.7330. 1. The information provided in this article is for educational purposes only. 2. Your individual health status and any required health care treatments can only be properly addressed by a professional healthcare provider of your choice. Remember: There is no adequate substitution for a personal consultation with your chosen health care provider. Therefore, we encourage you to make your own health care decisions based upon your research and in partnership with a qualified health care professional.